. :: OLYMPIC DREAMS - KARIM EL ZOGHBY ::. WHY IS THE OLYMPIC MEDAL SO SPECIAL? THERE ARE SO MANY OTHER CHAMPIONSHIPS AND GRAND PRIX’S, YET AN OLYMPIC MEDAL HAS A VALUE THAT IS UNMATCHED. THE OLYMPIC MEDAL REPRESENTS NOT JUST AN ATHLETE BUT A WHOLE NATION. PERHAPS THIS PROFOUND FEELING OF RESPONSIBILITY IS WHAT KEEPS THE OLYMPIC GAMES IN A LEAGUE OF ITS OWN AND AN OLYMPIC MEDAL IS TRULY THE BOND BETWEEN AN ATHLETE AND HIS PEOPLE. EL ZOGHBY CAME UP THROUGH THE SCHOOL OF HARD KNOCKS, TAKING HIS RIDING AS PRIME DESTINATION. BUT THE COINCIDENCE OF THE PROXIMITY OF HIS CHILDHOOD HOME IN EGYPT TO THE RIDING CLUB PUT THE YOUNG EL ZOGHBY ON A COLLISION COURSE WITH WHAT WAS TO BECOME HIS DESTINY, A LIFE LONG PASSION FOR HORSES AND SHOW JUMPING. 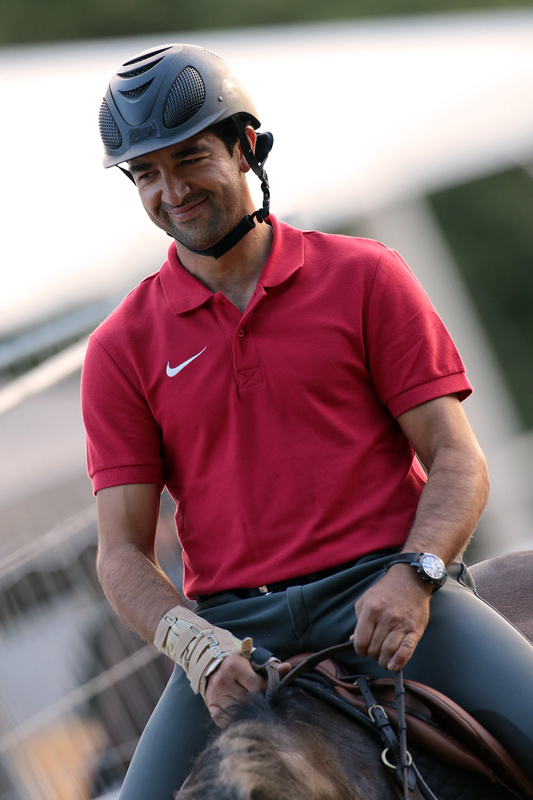 PARTICIPATING IN HIGH-LEVEL COMPETITIVE JUMPING SINCE 2002, WINNING MANYMEDALS, AWARDS AND FANS ALONG THE WAY, WITH TWO OLYMPICS BEHIND HIM, EL ZOGHBY NOW HAS HIS SIGHTS ON RIO. EL ZOGHBY TOOK TIME OUT OF HIS BUSY SCHEDULE TO TALK TO HORSE TIMES AND WE COULD SENSE IN HIS TONE AND MANNER HIS SINGULAR DETERIMINATION TO MEET OLYMPIC EXPECTATIONS, FOR HIMSELF, FOR HIS FAMILY AND FOR EGYPT. HERE ARE HIS THOUGHTS ON HIS GOALS, HIS READINESS FOR THE OLYMPICS, AND HIS SPECIAL MARE, AMELIA. How did you come across Amelia and when? I came across Amelia when she was 4 years old; I was looking at horses at my friend’s farm and he told me that he has a good 4-year-old that needs some work, so I bought her and that’s about it! When did you realise that she was a mare for a spectacular future? It’s very difficult to say about young horses and their future, they have to have the character and the heart and she has both. I sold her to my dear friend Samir Abdelfatah when she was turning five; I told him that she is a good mare but he has to put the future in her because at that time I didn’t ride young horses very often as I was busy building my stable. She came back in the middle of her eighth year but she was like a five-year-old because she didn’t know much. About the future, I think we all know it takes a lot of time, it takes building the character, it takes building the heart and making a happy horse, and creating the confidence between the horse and the rider. All of that takes so much time. When all those things are put together that’s when you can see the future more clearly but it takes a lot of time before reaching this point. What is she like at home in training? In the beginning training with her was quite impossible because, let’s put it this way, she’s been the boss for years in Egypt and Samir realised this and kept her away from a lot of shows and a lot of riders What he did was good but she lost a lot of her youth and a lot of her education when she was young. So in the beginning it was very difficult to train with her now she has been with me for two and a half years and training is basically keeping her fit, happy and keeping the muscles long and short and just a lot of work. She is out of the stable for 7 or 8 hours per day which keeps a mare like her in a happy mood all the time. What is she like at shows? At shows, she is a completely different horse. In the beginning she was a handful! She still is but she is super brave, super honest, she wants to do the job and she knows as soon as she arrives at the show that there is something going on and she wants to prove herself. This is what makes her who she is. It is lovely that she knows at the shows that this is work. Now, we’ve been training in 1.30m. Classes which are actually more difficult than a Grand Prix as she is in competition mode but the fences are small! So it’s definitely funny with her and she is a complete different horse at shows. How do you build such a relationship with a horse? Well, how to build this relationship is a very good question! Because it’s basically the time you spend with the horse and she is my best friend. For me, when I finish all the work at 6 pm, I just go and spend time with her in the stable and play with her in the indoor. It takes time, effort, forgiving and it takes so many things from both sides to be able to become best friends and accept each other’s good sides and bad sides. This is what every rider has to know, you have to accept your horse the way he is. There isn’t just one way to deal with horses and no right or wrong, we all wish it was but it isn’t. So just accept them and give them trust and deal with every horse depending on his personality and habits. How many Amelias did you come across in your career? That is a very difficult question. I have had a lot of very good horses but I never carried on riding them. I used to take a horse maybe 8 months before the show and sometimes 3 months and then sell them directly after, as a way of building myself. A lot of horses didn’t stay more than a year and a lot of good horses came across my path but I had to sell them as young horses. So I think I’m blessed to have Amelia at the right time and the right moment in my career. I am also very thankful for Samir and Wael for being very patriotic. They had many chances to sell this mare but they decided to go for the sport. I think the puzzle has fallen into place at the right time and I am blessed to have such people around me. They say that every special horse is a freak in some sense? Is this true and how does that apply to Amelia? That saying is actually very true! Amelia goes into her box and into the truck backwards; she just has her own tick and I don’t try to change that or force her to do something. Also, in the beginning it was very difficult to take her to the field as she would run as soon as she sees the door open, while now she just walks behind me without a rope. It just takes time as I said and don’t try to change them because that will destroy their character; you have to work with the character and make it work for you, not against you. Is she ready for the Olympics? It’s a new experience for me to have a horse for this long, so what I am trying to do is to keep her fit and she still goes to shows. It’s the sport and everyone thinks they are ready but it’s a very thin line between success and failure. I am doing my best to keep her happy and still keep her jumping, but not like she was jumping for the past year and a half to get qualified for the Olympics because that in my opinion was very hard for all the qualified horses. What are the things that you would be careful with regarding her performance? Regarding her performance we have to be very careful with her muscles because by nature, she is a horse that jumps way too big and she’s been that way since she was four. So after every show we have to massage her and get her muscles to relax because she is a fanatic. She overdoes things which sometimes works in her favour and other times against her. What are your hopes for the Olympics knowing that there is a bit of luck in play on that day? We are 75 riders and I think we all have the same dream, the Gold medal, and for sure we need luck because this isn’t like any other sport. Also, the Olympics is different than the world championships because it starts big the first three days and then the last day is very big. I really hope I make it to the final. The chances are open for everything, but we all know how the sport is! One pole can cost you a lot and in the London Olympics a time fault cost me that final. I pray to be on that final day and I hope that luck will be in our favour. How did you prepare mentally for the games? This time I’m trying to be relaxed and easy because every time I had that extra pressure of building a horse in a short time, they come to me jumping 1.30m and in five months I need to make them jump 1.60m which is very difficult and adds so much pressure on you. They are green horses and they are allowed to make mistakes but you can’t let them make mistakes and that makes life a lot more difficult. Now, I know Amelia very well and I had her for two and a half years so I’m more relaxed trying to manage the little details. This being your third Olympic games, do you still feel it's an enormous responsibility representing your country and being watched by the Egyptian people? I am very proud of the team that’s working with me, very proud of my owners. It is a team effort that got us all the way to the Olympics. I always tell all my students that they are ambassadors for their country whether they are riding an old horse or a young horse. So for me it’s the same, I feel that I am the ambassador for the sport and for my country. I hope I can make my country and my family proud and whatever happens always try to do your best.